He didn't get fired because he stopped Dabo Swinney for speeding, he got fired because he posted about it on a message board later after feeling that he needed to "clear the air." Why he felt that way is not entirely clear, but, well, would you want to be the cop that gave Clemson's coach a ticket at a supermarket 10 minutes from where the Tigers play? On Sept. 3, Swinney was driving 63 in a 35 on his way to a weekly radio show, recorded, apparently, at the Bi-Lo in Pickens, South Carolina. The coach was ticketed while signing autographs in the parking lot, but still managed to negotiate for the minimum possible fine. The police chief at the Pickens Police Department says that (now-former) officer Michael McClatchey "used company equipment at approximately 3:37 a.m. on Friday, Sept. 14, to make a post on Sports247.com, detailing his version of events." 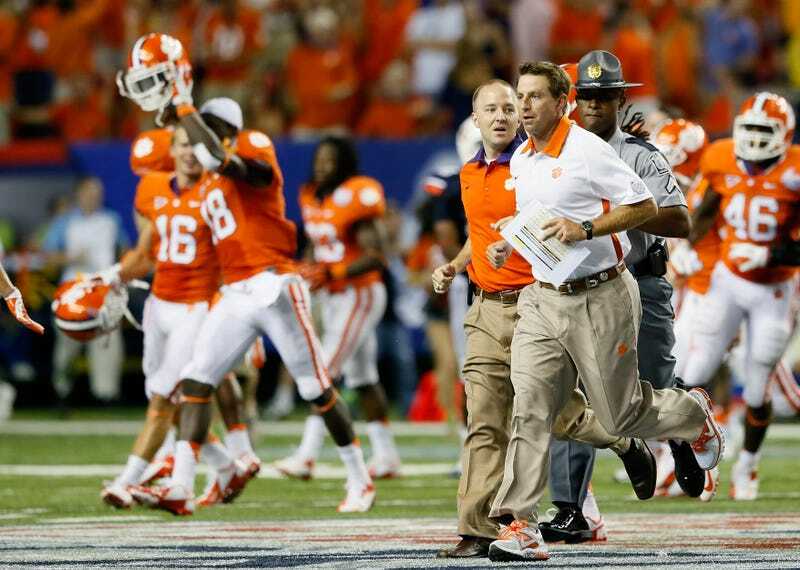 The officer said he believed Swinney "thought he would be excused for the violation and continue to his appointment." He said Swinney and his brother were asked to have a seat in the vehicle, which they did not. The officer also said the Bi-lo store manager approached him and told him a city official was on the phone and would like to speak with him, but the officer declined. According to the officer, Swinney's brother said that he was a retired Alabama police officer with more than 30 years of experience and asked the officer to take the fact into consideration. After placing the citation in his vehicle, the officer said, Swinney gave the officer "what I would call an unfriendly glare, shook his head and proceeded to enter Bi-lo." The police chief said McClatchey was "fired Monday for violation of city computer policy, violation of code of ethics and violation of general orders." General orders indeed! Sure sounds like that city official wanted to tell McClatchey to drop it. Damn it, McClatchey, when are you going to learn that big football runs this town?